ORIGINAL BROADCAST DATE: Saturday December 6th, 1986 from 10:30pm to 1:00am. SERIAL: Before presenting and mocking Gorilla at Large our machine-gun wielding Film Vault Technicians First Class presented and mocked an episode of Mysterious Doctor Satan, a Republic serial from 1940. 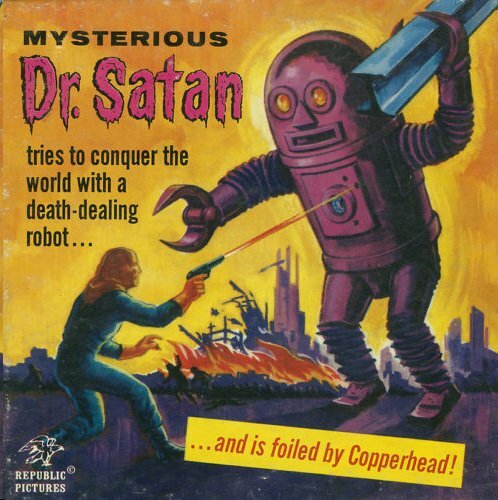 The serial featured a mad scientist called Dr Satan trying to take over the world with a very, VERY goofy- looking robot while a pulp-style hero called the Copperhead tried to thwart his plans. FILM VAULT LORE: This time around the movie ticket give-away from Channel 27 (the “27” in The Texas 27 Film Vault) was for a chance to go see the 1986 release King Kong Lives. 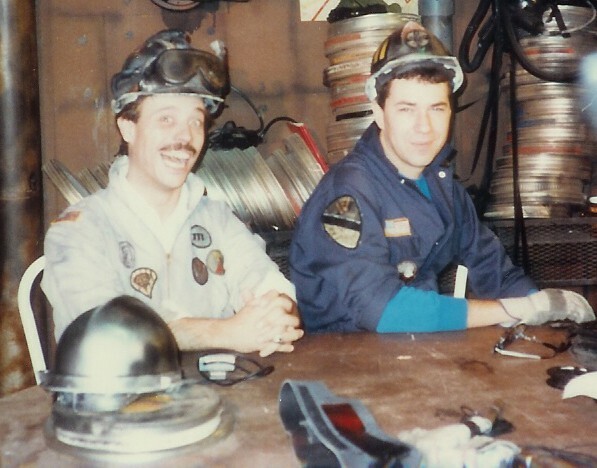 Richard Malmos (left) and Randy Clower relaxing between takes on the set of The Texas 27 Film Vault. HOST SEGMENTS: Gorilla at Large was one of the 3-D films from the 1950’s, and those are always funny and campy as hell, especially in the scenes with objects unnecessarily coming at the camera. The fun Randy and Richard had riffing on 3-D glasses and the whole 3-D phenomenon of the 50’s (and its 80’s revival) seems to have kicked off with this episode. In later episodes we’d get their “3-D interview” with Ben Johnson, a showing of Friday the 13th Part 3-D and even The Texas 27 Film Vault 3-D poster drawn by THE Kerry Gammil. 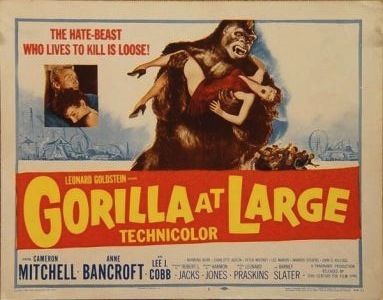 Gorilla at Large is one of the movies represented on that poster. * George Barrows, the man in the gorilla suit as our title monster Goliath, was the same guy who wore the ape/robot outfit as Ro-Man in that staple of Bad Movie shows Robot Monster (previously shown on The Texas 27 Film Vault). * Cameron “Close the F****ing Door” Mitchell, veteran of High Chaparral, The Andersonville Trial and countless bad movies, starred as Joey Matthews, the circus’ barker. * Anne Bancroft, “Mrs Robinson” herself and the real-life wife of Mel Brooks, co-starred as trapeze artist Laverne Miller. In the 1970s and 1980s Gorilla at Large had more public name recognition as a Golden Turkey because of the way Bancroft always joked about how awful the movie was whenever she was on The Tonight Show or elsewhere. * Lee Marvin, the future screen legend, played Shaughnessy the not-too-bright cop. * Lee J Cobb of The Virginian and much, much more played Detective Garrison, the man investigating the killings at the circus. Cobb had appeared in a stage production of Death of a Salesman with Cameron Mitchell of all people! * Raymond Burr, renowned as Perry Mason and Ironside among other characters, played Cy Miller, the owner of the murder-plagued circus. * Billy Curtis, one of the big screen’s most noted little people, played Slim, the circus’ midget. The plot, as if it mattered in a movie like this, involves a series of murders at a traveling circus. The gorilla Goliath seems to be the culprit but might be being framed by Cameron Mitchell, whose new act involves dressing up as a phony gorilla to spice up Anne Bancroft’s dangerous interplay with the “real” gorilla Goliath (George Barrows). Another man in a gorilla suit is seen letting the real gorilla loose to unleash mayhem at another point in the story just to add more complications. In the end, of course, Goliath the gorilla goes on a rampage with Anne Bancroft as his captive. Was Goliath behind all the killings? If not who was? I don’t want to spoil the central mystery of this movie by revealing too much. Suffice it to say the soap-operatic sub-plots involving embezzlement, love triangles and involuntary manslaughter will have you laughing at the sheer campiness of it all no matter WHO the secret mastermind is. I saw “The Mysterious Dr. Satan” not too long ago. One of the better serials with plenty of really good stunts. I think they wanted to use the Superman as the main hero but couldn’t get the rights, so invented their own character instead. Thanks for the info! I agree about Mysterious Dr Satan having a certain something. That’s interesting about the 3D glasses at stores for a television event. 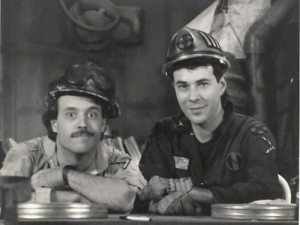 Rich Koz (Son of Svengoolie) also did a special 3D episode of his show in the 80’s like Randy and Richard did with Gorilla at Large and later with Friday the 13th Part 3D. I cannot get over this show! So awesome that it came before Rifftrax. This movie is awful! It’s funny to watch it.